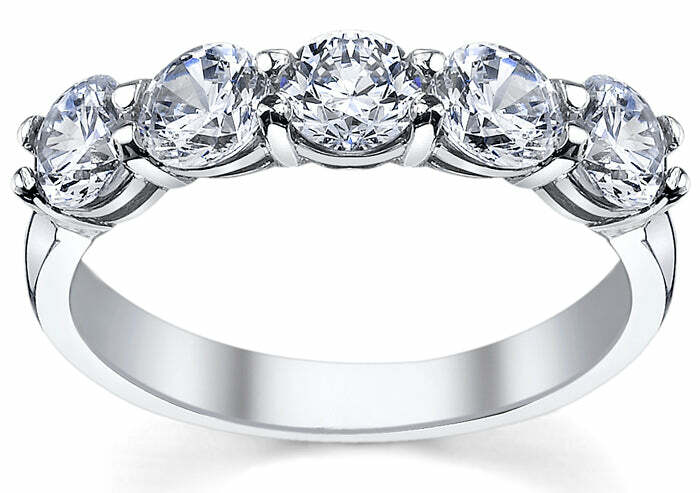 A five stone ring with round brilliant diamonds is a wonderful and appropriate 5 year anniversary gift. Finding the perfect 5 year anniversary gift should be an easy and fulfilling task. You should give your loved one something thoughtful that represents the five years that you have spent together as a married couple. A five stone ring that features either brilliant diamonds or gemstones is the perfect example of a piece of jewelry that represents your love and commitment. We have a wide selection of 5 year wedding anniversary gifts that will be perfect for your partner. One of these rings can be worn as a replacement or upgrade to an engagement ring or a wedding band. One of these rings can also be worn on your beloved’s right hand. If you would like assistance purchasing the perfect 5 year anniversary gift, we have GIA graduate gemologists available to answer any of your questions. They can also assist you in if you would like to buy loose diamond stones. Please give us a call at your convenience if you have any inquiries.